Back to Gregor (All be it only for a week as this seemed like a good point to end the current gag arc (Like a story arc but there's actualy a bit more of that in a couple of weeks. At the end of the month I'll be heading to the Whitby Goth Weekend. If your there do come up and give me a cup of tea. 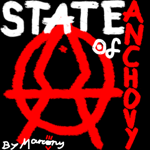 If you should happen to want a State of Anchovy T-Shirt let me know before hand and I'll bring some along. Enjoy the Anchovy.